KCC Egis held off Mobis Phoebus to stay alive in the series. The best player for the winners was American Brandon Brown (201-85, college: CS San Bernar.) who had a double-double by scoring 28 points, 16 rebounds and 5 assists. His fellow American import point guard Marcus Keene (180-95, college: Cent Michigan, agency: Pensack Sports) chipped in 23 points. 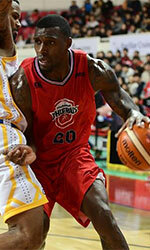 Brown is a former Eurobasket Summer League player, which is considered top international summer league in the market. At the other side the best for losing team was the former international forward Ricardo Ratliffe (203-89, college: Missouri) who recorded a double-double by scoring 19 points and 14 rebounds and international forward Dae-Sung Lee (192-90, college: BYU-Hawaii) added 23 points respectively. Mobis Phoebus' coach Jae-Hak Yoo rotated eleven players in this game, but that didn't help. ET Land prevailed against LG Sakers on the road to sweep the series. ET Land Elephants outrebounded LG Sakers 45-34 including 19 on the offensive glass. LG Sakers were plagued by 26 personal fouls down the stretch. It was a good game for American power forward Charles Rhodes (203-85, college: Mississippi St.) who led his team to a victory with 25 points and 6 rebounds. 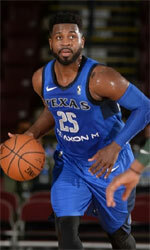 His fellow American import guard Giddy Potts (188-95, college: MTSU) contributed with 20 points and 8 rebounds for the winners. ET Land Elephants' coach Yoo Hoon allowed to play the deep bench players in such tough game. Central African-American power forward James Mays (205-86, college: Clemson) answered with a double-double by scoring 25 points and 10 rebounds and international center Jong-Kyu Kim (207-91) added 19 points and 7 rebounds (on 8-of-10 shooting from the field) in the effort for LG Sakers. Both teams had four players each who scored in double figures.